Babies and young children love their parents to sing to them. Nursery rhymes are a magical means of helping our little ones learn through play, while lullabies soothe and comfort them anytime of day. Ha. Ha. Even I can make up some rhyming lyrics. I was never much of a singer...in fact, before having children, I never sang. The reason being that I was self-conscious of my voice, felt like I didn't have much of a singing voice and more so did not have the natural ability to move to the rhythm of sounds and beats. So, I felt shy about singing out loud, even when in the presence of just myself. That changed after I had children and after I discovered a program called Music Together. I'll talk more about these later in the blog. I grew up in a household not so full of books or children's music. In fact, I remember my first experience with music did not happen until the end of 8th grade. I remember that I briefly attended an end of the year dance at my school (an after school thing). At the dance, they had music...go figure! Who would've thought that there must be music in order for there to be dance? (Being sarcastic here.) I enjoyed the music so much because it was my first time really hearing music, the lyrics, the beat...the beautiful sound of music. Immediately after getting home, I looked around our house for music...but, there was only the radio. So, I turned on the radio for the first time in my life and I discovered the world of music and wondered why it had been missing from my life for that long. But, as with most things in life, one must just be grateful when something is given and never look back on why it was not presented sooner...for all things come and go in our lives at just the right time. When I was pregnant with my first baby, I knew that I wanted music and singing to play a big role in my life and my children's lives. And I knew that I wanted the presence of music and singing to be part of our household forever. Most of us know the songs for Twinkle Twinkle Little Star and Rock-a-Bye-Baby, though in this age of media and technology it seems many traditional rhymes are being phased out in favor of pop songs or the lyrics to children's television programs. In search of good old classics and programs that really teach music to infants, I found a number of favorite programs, artists and books that still hold on to the classics. Here are a few of our favorites. Music Together...I cannot speak enough about this wonderful, wonderful program. I discovered this music program when my daughter was 4 months old. I immediately enrolled her. And ever since then, Music Together has been part of our household. Through Music Together, I mustered up courage to begin singing out loud to myself, to my baby, and even to my husband. Through Music Together, my daughter developed the ability to move to rhythms and beats and sing at a very young age. In four more weeks, she is going to turn 4. And up to this day, you will still hear her singing and humming throughout the house. She just loves music and she loves to sing. It is through music and books that both of my children developed language abilities at very young ages. And I would say that without Music Together, my enjoyment for music and singing to my children would not have unfolded the way that it has thus far. I sing to both my children every night. I sing in the car. I sing in the shower. I am always singing these days. This is very different from the old me. And this is due in part to the encouragement that the Music Together program provided to parents. Both my children love music and they love to sing and hum. Again, this is due in most part to being part of Music Together. We love Putumayo Music in this house. We own many of the Putumayo collections. 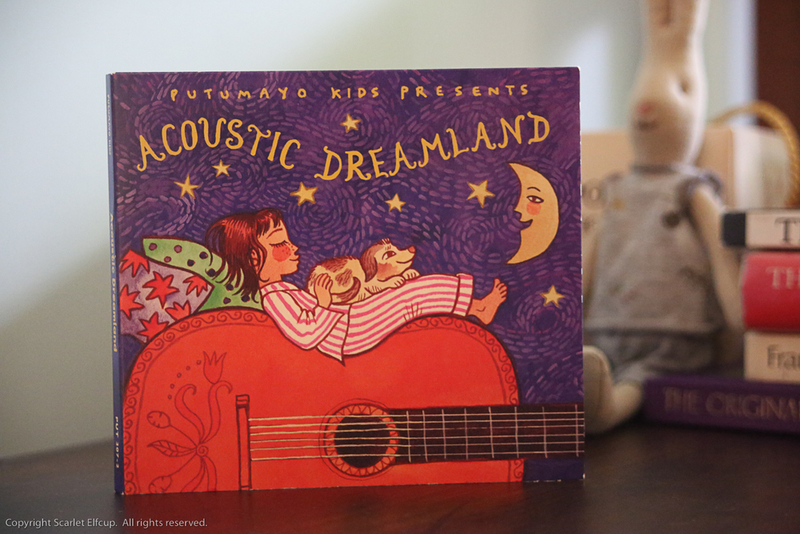 Two of my favorites for children's music are Dreamland, World Lullabies & Soothing Songs and Acoustic Dreamland. In Dreamland, one of my all time favorites is Erick Manana's Ny Fitiavako An'I Mama - (Madagascar). Manana has a beautiful voice and Ny Fitiavako tears me up each time I listen to it because it's so beautiful. I'm still on the search for the proper translation of the song's lyrics. I love this version of Hush Little Baby by Sylvia Long. Some more favorites that are part of our household music is Susie Tallman's music. In the Classic Nursery Rhymes collection is a lullaby/nursery rhyme that I love to sing to my children. It inspired the upcoming Scarlet Elfcup creation.